Aside from producing plant air, a compressor is actually also a source of heat that can be recovered and used to heat spaces and fluids. The result for the end user can be significantly reduced energy costs. With winter just around the corner, in this blog post we learn how you can turn your compressors into an energy source by harnessing the power of heat recovery in the fight against rising energy costs. 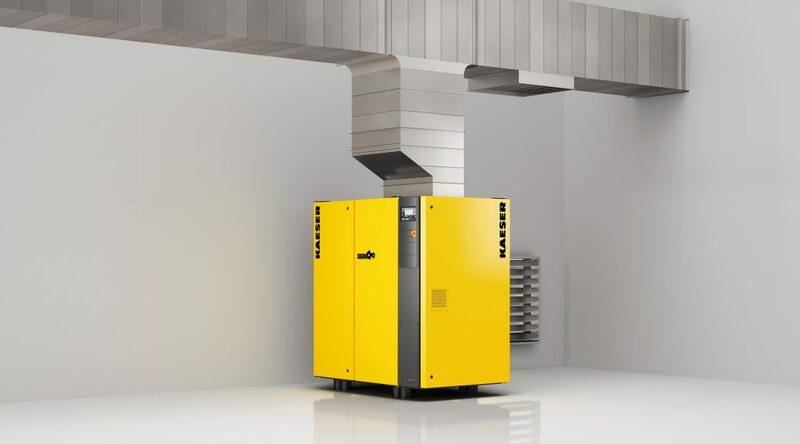 Did you realise that 100% of the electrical energy used by an industrial air compressor is converted into heat and most importantly, 96% can be recovered? Typically this heat is lost to the ambient environment through the compressor cooling system. However it can be recovered and put to good use elsewhere such as heating areas of a facility to heating water. Heat recovery has the potential therefore to significantly lower a facility’s energy costs. As an example of the potential savings let’s consider a production facility with a 160 kW compressed air system, that consumes about 176 kW of electricity during 8,000 operating hours per year. The annual consumption would equate to some 1.41 million kWh. If we were to capture all 96% of the residual heat, this would mean 4.62 billion BTUs available for heat. This could replace up to 102,181 L of heating oil or up to 107,305 m3 of natural gas per year. Oil lubricated rotary screw compressors are the most common type of compressors found in a manufacturing plant today. Very good heat recovery results can be achieved when the base load rotary screw compressor is operating at 85 oC or higher. Oil free rotary screw compressors are also well suited for heat recovery. Warm air is extracted by ducting the air from the compressor package to an area that requires heating by installing HVAC ductwork and controls. The air is heated by passing it across the compressor’s aftercooler and lubricant cooler. This extracts heat from both the compressed air and the lubricant. The method also improves air quality and extends lubricant life. Most modern screw compressors have cabinets that channel airflow through the compressor and exhaust warm air out the top of the unit. This makes adapting such compressors for space heating really simple, requiring the installation of ducting and sometimes a supplemental fan to handle duct loading and to eliminate back pressure on the compressor cooling fan. It is possible to ‘harvest’ around 17,655 BTUs of energy per hour for each 1 m3/min of capacity, based on 80% recoverable heat from the compressor and a conversion factor of 1,900 BTU/kW-hr. However recovery efficiencies of up to 90% are frequently attained. Space heating can be easily regulated with thermostatically controlled motorised louver flaps for venting. And, when heating is not required in the warmer months, the hot air can be ducted outside the building to reduce cooling costs. The rejected heat from air cooled oil injected rotary screw compressors as well as water cooled oil injected and oil free rotary screw compressors can all be used to heat water or other fluids, although the best efficiencies are usually obtained from water-cooled installations. Here discharged cooling water is connected directly to a continuous process heating application for year round energy savings. An application example would be heating a boiler’s return circuit. Current heightened energy costs certainly make an investment into heat recovery an attractive option. If you are considering installing a heat recovery system you will want to calculate what the potential energy savings and payback periods will be. In general terms, the larger the compressed air system, the faster the payback. It is however also worth comparing your current source of energy and its associated costs. It’s fair to say that higher energy savings will be realised where the alternative heating source is older or a less efficient technology. It may be the case that investing in newer and more energy efficient equipment may be more cost effective than heat recovery. There is certainly some homework to be done before making any decision. It’s also good to know that most facilities can benefit from heat recovery from compressed air systems throughout the year – not just during the colder winter months. In most space heating applications, removing the heat of compression will make the compressor room temperatures more comfortable throughout the year and, maintaining proper ambient conditions has the additional benefit of improving compressor efficiency, while controlling operating temperatures will also extend compressed air equipment life.